Yassin Aref is a Kurd from Iraq. He was a resident of Albany, New York. He was unfairly accused of supporting terrorists and sent to a special prison in Terre Haute, Indiana. The purpose of this site is to tell you who Yassin Aref really is and his interesting story; his struggle as a Kurd in Iraq, how he survived the Anfal genocide, his struggle for freedom, his journey to America with his family; and above all, how he ended up in prison. To learn of his story and about the Kurdish struggle for rights and liberty, Yassin wrote for you his life’s story, Son of Mountains. 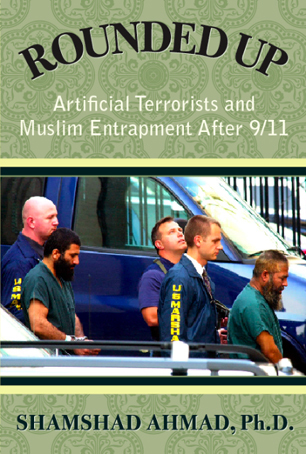 Rounded Up: Artificial Terrorists and Muslim Entrapment After 9/11, by Dr. Shamshad Ahmad, president of the Masjid As-Salam mosque in Albany and the 2007 recipient of the Jim Perry Progressive Leadership Award from Citizen Action of the Capital District, is now available nationwide. Rounded Up is the only comprehensive account of the Albany case available, and there is only one other book on the market about a domestic terrorism case itself. Rounded Up is an important contribution to the new body of literature about the government’s preemptive prosecution of Muslims in America. To order and to read more about the book, clickhere. who have come to life together. pain has patience and will not leave me! cool off, ending my energy. “The food is ready,” she said. NOTE: Sazan Mandalawi was a columnist for the English-language Kurdish Globe newspaper (based in Erbil, Iraq). In April she announced that she was leaving her job as columnist to study at a university in the UK for an advanced degree. In Kurdistan, she discovered Yassin’s book, Son of Mountains, and began to send back issues of Kurdish Globe to one of his supporters, to send to him. This letter responds to the news of Sazan saying goodbye to her readers in her last column. I survived by my faith. What privileges are better than being human and born healthy? For parents, what joy is equal to the joy of having children? What feeling is stronger then the human feeling of having a successor who can inherit? Yet poverty and an unstable situation force many people to stay single and many couples to avoid having children. Kurds––as a nation, despite their horrible situation and uncertain future––have always liked children and want to have as many children as they can. When Kurds would learn that their sons were killed in an army attack or were disappeared by security forces, I heard from many people that their response was to proudly read the Kurdish proverb, BARKHI NER BO SARBRINA, which means, “The lamb is for sacrifice, to be slaughtered.” It was never a surprise that our youths died and disappeared; the amazing miracle for them was to survive. the one who has no life? the one who experienced exile? Human life has developed for thousands of years. Many things have changed: the growth of societies, forms of government, ideologies, and science and technology provide experiences beyond the dreams of our ancestors. Yet our basic needs and main worries remain the same, because people across the globe have all shared similar experiences. Whoever studies cultures and the histories of nations will find many similarities, especially in philosophy, wisdom, and proverbs. Aram is a famous businessman whose name is an example of success. His honesty and trustworthiness are on everybody’s tongue. People usually come to him for all sorts of assistance and advice, and he always makes himself available to them. In Germany they first came for the Communists, but I didn’t speak up because I wasn’t a Communist. Then the came for the Jews, and I didn’t speak up because I wasn’t a Jew. Then they came for the trade unionists, and I didn’t speak up because I wasn’t a trade unionist. Then they came for the Catholics, and I didn’t speak up because I was a Protestant. Then they came for me, and by that time no one was left to speak up.